Newly issued Mixed Tape #55 by Mercedes Benz supports the good life concept, by being musically and visually super-designed in order to provide the perfect backdrop for smooth driving. Dave Kinsey, one of the foremost Los Angeles urban artists was commissioned for this MB collaboration project. He was to create the visual identity of the album, which features ten musical numbers from around the world. 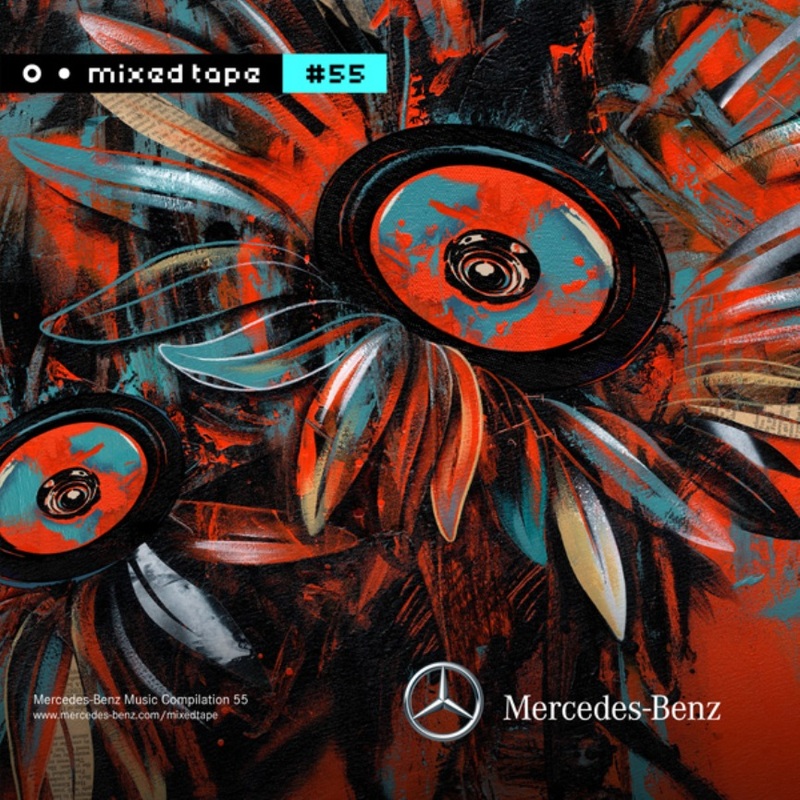 His floral design, vitalized by vivid contrast of color is just retro and just contemporary enough to ensure the ideal visual introduction into the musical content of the Mercedes Benz Mix Tape #55. 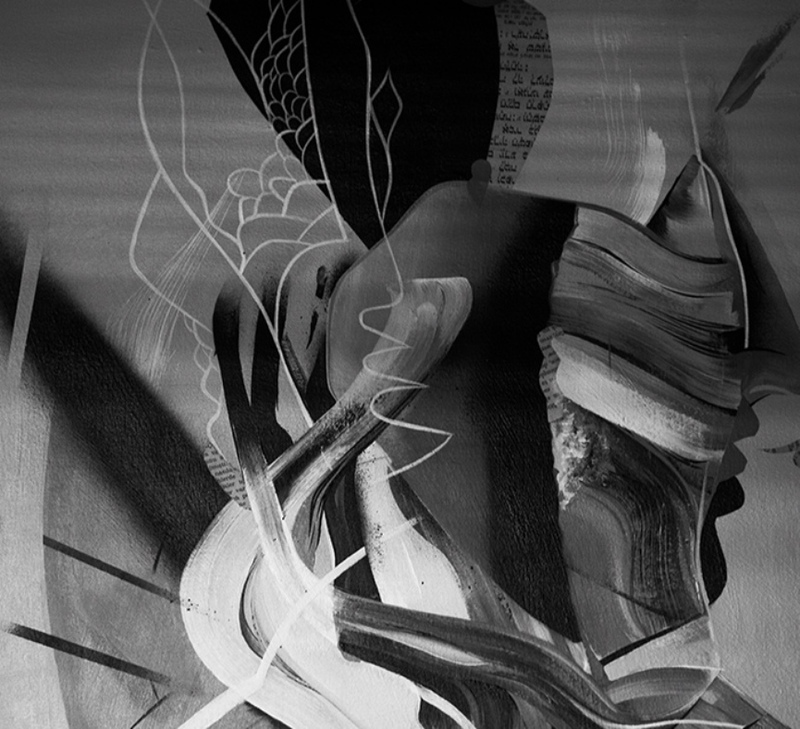 Dave Kinsey grew as an artist under the strong influence of skate culture and street art. Today, he is a prominent and a very sought after muralist and designer, who has collaborated with important clients, such as Standard Hotel in LA, Absolut, Pharrell Williams and now, with Mercedes Benz. He started designing with Shepard Fairey in the BLK/MRKT studio, which now envisions identities for numerous brands such as Adidas, Heineken or Mountain Dew. Commercially successful, Dave Kinsey never neglected the artistic side of his projects. He is a true whiz when it comes to technique and execution, and over time he developed a singular pictorial style based in the realm of symbolic representation and vibrant color. He lets his creativity flow take over and conjures up wonderful pieces of fine art, conveying his inner emotional or mental state. They are created with a very high regard towards aesthetics, but conceptually they are layered and largely open to interpretation. 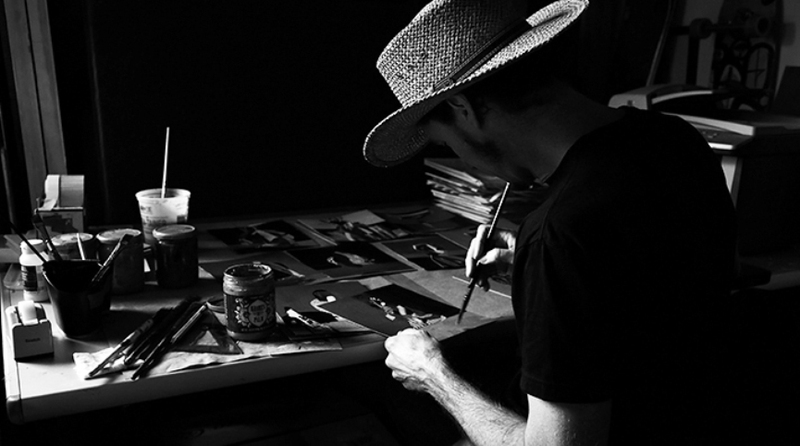 Dave Kinsey creates in his studio in the Sierras, where he gave an interview to the Mercedes Benz Zeitgeist. Here, we transfer this interesting conversation in full, with Dave Kinsey talking about his beginnings, influences, and music. MBZ | People tend to associate your art with a movement that includes Shepard Fairey and other urban “street” artists. This movement quickly gained momentum for working outside what is considered the traditional confinements of art – can you tell us how that got started? DK | This was around the same time that punk, hip hop and skate culture started resonating with me. I feel that I was drawn to these genres due to their raw nature of self-expression, the honoring of originality, and what felt like a rejection of traditional rules. At that time, these things were an alternative lifestyle to the norm, and the art became a visual declaration of that new energy. MBZ | You have a background in graphic design – can you tell us how that has influenced your art? DK | My creative process is informed by my experience as a designer mainly in the area of logistics. I know how to get from idea to finished piece more efficiently. I also feel design is an inherent component of art to some degree, so I utilize some of the same thought processes to fulfill my vision—color, composition, and how a message can be presented visually. The elemental make-up of images in my work is indicative of the way I feel about the world around me; there’s a lot going on all at once, which I try to convey with all the visual layering and chaos within my pieces. MBZ | You seem to make no distinction between art and advertising, is that true? DK | No. I happen to be involved in both worlds, but there is definitely a place and time for advertising vs. fine art. What I have said is that I feel most advertising can be done a lot more creatively to include more artistic elements. Advertising is primarily visual, and I think a lot of it is visually insulting to the viewer. That’s part of the premise that I founded my design studio, BLK/MRKT. Some of my personal artwork has been translated to the commercial realm – on a wine label, for instance – but, generally, my design work for advertising is very different from the artwork I create. It is interesting to remember, though, that before modern advertising, art was the advertising for churches, dictators and kings. MBZ | How did your design studio BLK/MRKT come into being? DK | I started BLK/MRKT in 1997 with fellow designer Shepard Fairey. We really wanted to change the rules of the current mainstream advertising landscape. Big companies aimed at the youth market just weren’t speaking to their demographic in the right tone, and the visuals were completely “off”. Artistic elements, as I stated before, were basically obsolete in advertising, so we decided to make striking visuals the primary focus of everything we created. It took a couple of years to get clients to take the risk, but once they did everything came full circle. When BLK/MRKT was formed we became a magnet for like-minded people: designers, painters, directors, even musicians. We started up in the relatively small city of San Diego, California, so it was easy to congregate. The cool thing is, almost everyone who worked with us ended up going on to doing great things, so the sharing of ideas and energy spread through the people we came in contact with as well. It’s humbling, because we were basically able to create the world we wanted instead of working for an agency or something like that. MBZ | You have worked with many interesting and creative people – who would you love to work with in the future? DK | Frank Gehry. I feel his work is transcending the times. I also feel he’s not letting the status quo or financial pocket packing influence or compromise his vision, so I respect his integrity. MBZ | In what way was the artist in you discovered or nurtured in your childhood? DK | To be honest, I can’t remember ever not drawing; I actually never even thought about it despite it being an everyday activity in my life. It was an outlet for me to go into my own world, traveling through my imagination. When I got into art school though, everything changed when I realized I could make a career out of doing what I love. MBZ | Some artists need music in order to work, what do you listen to while working? DK | Yeah, I’m one of those artists, and music is one of the most essential components of my creative process. I have very eclectic tastes, so depending on my mood it can vary from classic rock to jazz, hip hop, and indie-rock, even classical at times. MBZ | What’s your favorite album cover of all time? DK | Oh, that’s a tough one, there are so many greats. I’d say Pink Floyd’s “Dark Side of the Moon” because it’s so iconic and visually effective.